Ali Mohamed Ali, the Hong Kong government’s official – and only – Somali translator not only provides a voice for new refugee arrivals in the city. He also is also the first Somali to have been awarded a Home Return Permit from the Chinese government. Cook Helina Tesega is showing the city what’s ‘wot’ when it comes to Ethiopian dining. 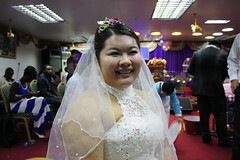 Afro-Chinese marriages boom in Guangzhou: but will it be ’til death do us part’? Post Magazine interview with Barack Obama’s half brother Mark Okoth Ndesandjo Obama in his adopted hometown of Shenzhen.